The most important as well as the most popular salad plant grown in this country, lettuce is not exacting in its requirements. It may fail in dry, poor ground; given a reasonably rich and moist root-run it grows quickly – which is the secret of those crisp, tender hearts which make such delicious eating in hot summer. Its very desirable qualities make it worth growing the whole year round, and this can be achieved with the aid of warm greenhouse and frame. Choice of varieties is largely a matter of taste, and most home food producers grow both the cos and the cabbage kinds. The cos lettuce has long leaves and grows upright, and needs to be blanched by having the leaves banded together near the top. The cabbage lettuce is squat – low-growing – and does not need that attention. If there is anything to choose between the two kinds it is that the cabbage lettuce stands the better chance in thin, quick-drying soil; whereas the cos kinds in similar circumstances are inclined to bolt, that is, rush up to flower. Varieties of cabbage lettuce for sowing outdoors in spring and summer include Standwell, Continuity, Holborn Standard, All the Year Round (all four specially resistant to drought and disinclined to bolt), Drumhead, Favourite, Golden Ball, May King, May Queen. Cos varieties for summer use include Paris White, Superb White, Mammoth White, Little Gem. Cabbage lettuces for autumn outdoor sowing, to heart up the following spring, include Hammersmith Hardy Green, Imperial, Arctic, Stanstead Park, Commodore Nutt. Cos varieties to stand the winter outdoors (autumn-sown) include Black-seeded Bath and Winter White. For heated greenhouse and hotbed frame culture the following cabbage varieties are most suitable: Golden Ball, Commodore Nutt, Early Paris, Majestic, May Queen, Tom Thumb. An ounce of lettuce seed should yield about 2,000 plants, and average period of germination is about nine days. Ready for Use. From late spring or early summer on to autumn, from outdoor sowings. With the aid of a frame the period is extended. The full cycle of the year can be completed by raising plants in the early weeks of the year in a temperature of 65 degrees. Lettuce is ready for use about ten to twelve weeks after sowing. The ideal soil for lettuce is one that crumbles between the fingers – but is not dusty or sandy – and contains plenty of humus: that is, rotted manure or rotted vegetable matter. One of the proprietary brands of hop manure will transform thin, light, hungry ground. Though the soil needs to be broken up at least I ft. deep it is no use burying these enriching materials at that depth. They should be mixed with the top few inches, or the roots will never get to the food. If manure or manure substitute is very scarce, what little there is can be made to go farther by lining it into the bottom of 6-in. deep drills, to the depth of 1 in. or 2 in., and covering it with 1 in. of soil. Planted in this, young lettuce plants start well, and will continue well if the drill is kept well supplied with water in hot and dry weather. This is the best treatment for light soil. Clay soil can be dealt with similarly, with sand, grit, ashes or crushed mortar rubble to break it up and keep it open. Wood ash raked plentifully into the surface – after the other attentions have been carried out – or scattered in the drill before planting is conducive to quick growth and leaf formation. For ordinary, everyday use, lettuce is sown outdoors from March to August; and the contents of a small packet can be made to produce a long-drawn-out supply, by the simple expedient of sowing the merest pinch of seed every ten days or so. Thus plants are secured in all stages – a half-dozen plants ready for use, another half-dozen nearing that stage, and so backward to a row of seedlings waiting to be thinned out or transplanted, and a row of newly sown seed. The sowing of an entire packet at once will mean a wasteful glut, unless there is a really large demand. Lettuce plants bolt if not used within reasonable time. Seed can be sown very thinly in a ½ in. deep drill and, duly thinned out to 9 in. apart, allowed to remain there and heart up. Or the seedlings can be lifted with a trowel and transplanted to where they are to finish. Or seedlings can be raised in a shallow box and then planted out. Whichever plan is adopted the soil should be moist at all stages: before the seed is sown and up to the time of pulling the mature lettuce for use. Earliest and latest sowings do best in a sunny, sheltered position; in the home garden a border at the foot of a fence or wall facing south is excellent. On an open allotment the earliest sowings can be protected (from heavy rain as much as from cold) and germination hastened by covering the sown drill with odd bits of glass ; or by sowing in a box and placing this in another box covered with a sheet of glass. Summer sowings and plantings need shade from midday sun. The south-facing border is then unsuitable. Partial shade is secured by sowing or planting between rows of peas, runner beans or other tall-growing plants. Though tins is of less importance in moisture-holding soils it applies in full measure to light ground that is always drying out. Plants sown in a permanent row need to be thinned out as soon as they can be handled to 3 in. apart. The first thinnings can be transplanted elsewhere if lifted complete with roots, from moist soil to moist soil. At the next (final) thinning out – before the remaining plants touch – they will be withdrawn in pairs, so that those left stand at 9 in. apart. 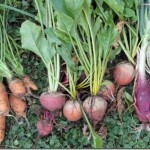 These final thinnings are very tender and tasty and should be used for salad purposes. It is best to avoid transplanting from the time the weather warms up in May or early June, unless the moved plants can be kept constantly supplied with water. A drought-induced check will cause them to bolt. Unoccupied spaces such as the banked-up sides of a celery or leek trench should not be overlooked as a site for lettuce. Neither crop will interfere with the other, for the lettuce if sown or planted out early enough will be used up before the earthing up of the celery or leeks begins. Enough water should be given at a time to soak well down to the roots, and as soon as plants are out of the seedling stage they will respond to doses of nitrate of soda sprinkled along the row and between at the rate of 1 ounce to 3 yd. of row, this to be watered in, about once a fortnight. A plant that suddenly runs up loosely is going to flower, and nothing can be done to stop it. It should be pulled up and fed to the chickens or rabbits. Too much sun, not enough water or food – any or all of these will cause bolting. In areas where this trouble is persistent it will be found that it is nearly always the cos varieties that are the offenders. So far as drought is concerned, the cabbage varieties are far more reliable. Cabbage varieties do not need to have the leaves bunched together to induce blanching. It is necessary only with the cos (upright growing) kinds, the operation ensuring that hearts and inner leaves of these shall be made tender and crisp and more or less white by the exclusion of light. The outer leaves are held together at the top with one hand whilst a piece of raffia is slipped around with the other, not tightly but securely, at a point well above the centre of the plant. The raffia is then tied. Instead of raffia a rubber band may be slipped over (’ 148). The time to do this is when the plants are nearly full grown and when the leaves are not moist with rain or dew or after watering. Pulling for Use. Cos varieties are ready for pulling up about ten days after the tie (or rubber band) has been given; cabbage varieties when the hearts are nice and dense. A slug will walk a mile to get at a juicy lettuce seedling. Baffle it by dusting the young plants with old soot; that straight from the chimney is too burning for use on the foliage, but it is an excellent deterrent if sprinkled thickly on the soil all around each plant. Or lime may be used as a surface dressing. Leather jackets also have a great liking for this crop, in all stages. Deal with them, and with cutworms, where also will be found directions for dealing with green fly and two diseases which afflict lettuce. Varieties previously mentioned for autumn sowing (late August and September) should be sown in a sunny, sheltered position where, thinned out, they can be covered with glass or given other protection during hard weather. Or the plants may be lifted and replanted at the foot of a south-facing fence or wall before winter sets in. In cold districts, or where the soil lies wet and heavy in winter, they will be safer transplanted to a cold frame, and given plenty of air in good weather, but only just enough water to keep them going. They must have a depth of good soil in the frame, all light possible, and slugs should be watched for. A sowing in a cold frame in October will give strong young plants for setting out in a sheltered spot in March. A greenhouse, or hotbed frame, with a temperature of about 55 degrees by night makes possible sowings in January, February, March, for setting out in the open in March, April and May respectively. Varieties previously mentioned for heated greenhouse and hotbed frame culture can be grown in boxes (from first to last under glass) for using young during mid-winter. The ordinary grower, however, will find all his requirements met by outdoor sowings. Remove roots, soiled outer leaves, wash, and dry by enclosing in a cloth and swishing this to and fro in the air. 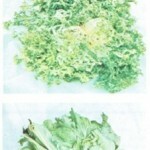 Eaten raw, lettuce has laxative, antiscorbutic and cooling properties. It can also be boiled like spinach, and in this form it is a vegetable recommended by doctors for convalescents.